GCSEs are changing. There will be new GCSEs in English Language, English Literature and Maths with the first new exams for these subjects in Summer 2017. Not only are the new courses more challenging with all exams sat at the end of year 11 but coursework and practical assessments will play a much smaller part with most marks won or lost in exams. Furthermore, there will be no foundation level in the new English GCSEs so everyone will take the same exam. 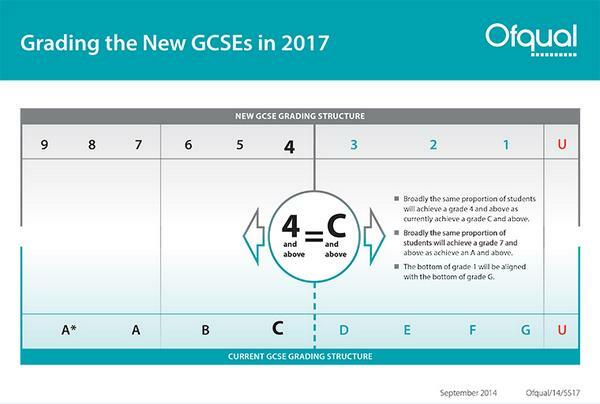 On top of all this, the way the new GCSEs are graded is also changing. The new GCSEs will be graded 1 to 9 with 9 being the top grade. You will notice the old A*-G system has only 8 different grades whereas the new system has 9 different grades so direct comparisons between the two systems are discouraged. However, broadly the same population of students will achieve a grade 4 and above as currently achieve a grade C and above. Likewise, broadly the same population of students will achieve a grade 7 and above as currently achieve a grade A and above. A grade 9 will be saved for the very top end of students who currently achieve a grade A*. The bottom of grade 1 will be aligned with the bottom of grade G. Those who fail to meet the minimum standard will be graded a U as before. In Summer 2017 GCSEs other than English and Maths will remain the same and will be graded A*-G. However, further new or “reformed” GCSEs will be introduced in 2018 and 2019 and these will also be graded with the new 1-9 system. Click here to see our new Year 9 GCSE Course Guide.